: Chef Alon Shaya, who was born in Israel, originally founded this restaurant to offer modern interpretations of recipes he first experienced as a child at his own family dinner table. Zachary Engel has since taken over the duties of executive chef since Shaya's departure from John Besh's restaurant group. This contemporary, see-and-be-seen spot on Magazine Street features perhaps the coolest patio dining in town. The interior designer chose a full neutral palette with comfortable upholstered furnishings and easy-on-the-eye lighting. The menu is influenced by North Africa, the Middle East, Eastern Europe, Turkey and Greece. Look for familiar flavors such as tahini, falafel and tender lamb kebabs. But more exotic options include shakshouka (sunchokes, spicy chilies, tomato and egg); lutenitsa (Bulgarian purée of roasted pepper); and Turkish coffee cake made with pumpkin and cocoa and served with date ice cream. 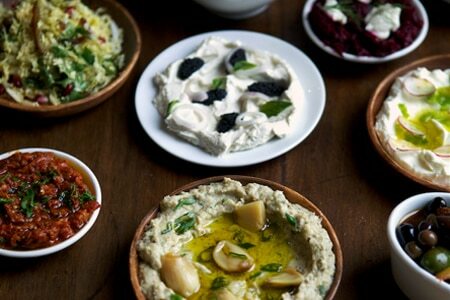 Shaya may be the only restaurant in the city offering Israeli beers and wines.